Your love affair with cheesecake doesn't have to derail your diet. 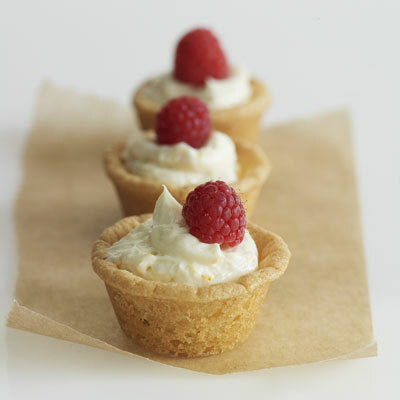 This recipe for Mini Raspberry Tarts helps satisfy your craving for that sweet, full-fat flavor without all the extra calories. This easy recipe uses refrigerated sugar cookie dough for the crust, reduced-fat cream cheese to cut calories, and fresh raspberries for the sweet taste. Using a mini muffin pan cuts down on the serving size, so this treat is only 85 calories per serving. These adorable, bite-sized treats would look great on any holiday buffet. Bake them as hostess gifts, or keep a batch at home. With a lighter alternative in your refrigerator, you'll find it easier to turn down some of those rich desserts at your next holiday party.